Construction • Minimum Maintenance "Naval Architects: Robert Allan, Ltd.. for Gulf Canada Resources, Inc.
Calif., has been awarded a $10,284,918 firm-fixed-price con- tract for the overhaul of subma- rine tender USS Dickson (AS-37). Calif, is the contracting activity. Mexico. Tenneco Oil Explorations and Productions, Eastern Gulf Di- vision, awarded the contract. Com- pletion of the quarters unit is ex- pected in early 1984. It will contain approximately 5,000 square feet of living space. The Consafe type of modular construction is used worldwide, but this project represents a breakthrough to Consafe design for the Gulf of Mexico. According to Consafe president Bertil Lars- son: "Consafe provides heavy-duty steel construction in its units, which can be used for clustering as well as for temporary or per- manent use. Total flexibility is a primary feature of Consafe design." 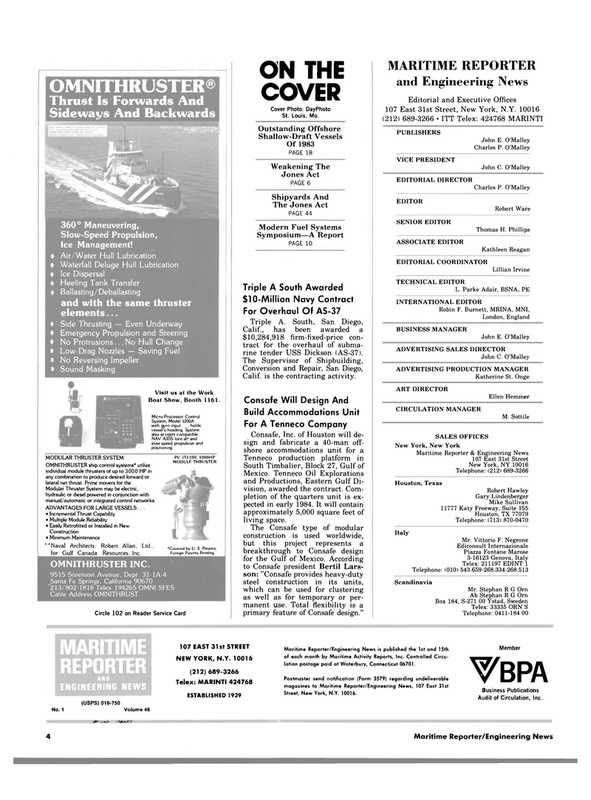 Maritime Reporter/Engineering News is published the 1st and 15th of each month by Maritime Activity Reports, Inc. Controlled Circu- lation postage paid at Waterbury, Connecticut 06701. Street, New York, N.Y. 10016.